Make ice cream, sorbet, frozen yogurt and gelato at home. Now you can make your favorite flavors of ice cream, sorbet, frozen yogurt and gelato right in your own kitchen—in less than an hour. Breville’s fully automatic ice cream maker boasts a range of automatic hardness settings, making it easy to create a frozen treat with just the right consistency. Mix up a fresh, palate-cleansing sorbet for your gourmet meal, or concoct an indulgent ice cream sandwich filling. The Smart Scoop is fully compressor-driven, meaning there’s no need to work with pre-frozen bowls or mixes. Instead, you can simply add your ice cream base to the machine and push a button. When its time to add mix-ins—think chocolate chips, chopped fruit or flavor syrups—simply pour them through the flip-back lid. When your frozen treat is ready, the Breville Smart Scoop will alert you with a beep or your choice of nostalgic tune. If you’re not quite ready to serve, just use the “hold” feature to keep your ice cream at your preferred consistency for up to three hours. Dimensions: 16" x 11" x 9.5"
Weight: 30 lbs, 9 oz. Love it! So much better than having to store the canister in the freezer. This machine is so very simple to use. I had not used an ice cream maker since I was a kid on the farm and we used to crank it after we gathered the ice from the edge of the pond. We use two ice cream experts books for reference. David Lebowitz and Dana Cree. They are both excellent. It’s a definite upgrade and worth it! Professional Homemade Ice Cream at Home! I was on the lookout for a new ice cream maker and did a lot of research to find a good one. After plenty of research, I had to go with this one, and boy... I'm so glad I did! The machine may be expensive, but trust me, you get what you pay for! I love how you don't have to pre-freeze any bowls that way I can make ice cream whenever I want! Plus the Pre-Cool and Keep Cool Buttons are Super Convenient! Plus the hardness dial to get the exact consistency I want! But what sold me is the ice cream truck sounds to alert you your dessert is ready! I have made several desserts in this machine, and let me tell you, the results are out of this world! If you love homemade ice cream and want professional results at home, this is the machine for you! Last minute ice cream can't be beat!!! I've had multiple ice cream makers, but this one is the best. I don't have to fill my freezer with a container, I don't need ice & salt, and I no longer have a condensation mess. I can quickly make any flavor I want in any amount of time. I use a standard recipe of 1 pt. half & half, 1 pt. whipping cream, and 1 cup sugar. After that, I add what ever ingredients I want. It's quick, easy, and without mess. The only drawback is the size of the container. It isn't that big of deal to make up a second batch. This is great makes delicious ice cream. Has several settings. So whether you like it hard or soft this machine will do it. Best ice cream maker on the market! From frozen yogurt and Gelato to ice cream and sorbet, this machine does it all in a fraction of the time it takes other lesser comparable machines. The hazelnut Gelato and honey pear frozen yogurt I recently made turned out great! My only complaint about this ice cream compressor is the capacity is somewhat small. On the otherhand it is easy enough to mix up a second batch. Amazing ice cream. So pure and fresh tasting without all the added artificial ingredients. Most importantly, you can reduce the amount of sugar in any recipe (by half)! Ice cream will be a little harder and not as creamy because chemicals have been eliminated. My suggestion is eat it at its softer stage or only freeze a few hours if guests are expected. This little jewel makes the best ice cream. It's almost foolproof. My first try at cooked ice cream base and even though I didn't do a perfect job, our vanilla, chocolate, and strawberry came out perfectly. Even though this is a bit pricy, we are so glad we didn't decide on a less expensive ice cream maker. Worth every penny and then some. Very, very satisfied. Great machine. Perfect product each time - awesome sorbet and ideal ice cream. My only concern is the size of this machine. It's really big and takes lots of space. This machine is awesome! It does an awesome job of churning gelato correctly. Its not too hard when it sets in the freezer. Great Brand. Friend has this machine and I've seen it work great first hand while over his house. You don't have to pre-chill the container for 8 hours prior to using. This had the best reviews for ice cream makers and the personal comments by purchasers were outstanding. We want to make delicious fresh fruit sorbet like the kind we have eaten in Europe. Had the highest reviews for gelato across multiple sites and was on sale here. My husband has always wanted one. Makes making ice cream easy and fun. Cleans up in a snap. No need to freeze bowls. You make as much ice cream, whenever you want. Breville is a great brand and I like the fact that it includes the compressor. Granddaughter wanted an ice cream maker and I like that you don't have to keep a bowl in the freezer and can just use when you want. This is an upgrade, I like being able to choose different types instead of just one type. Hoping it will do the job without putting a container in the freezer. I did a lot of research and comparisons. It was between the Whynter, Cuisinart or Breville, all similar. However, when I watched the video for the Breville, the chimes and the music option sold me! I know, can you believe it! If only those other companies had the little dingers, they might have got my order! The convenience of not having to pre-chill the container for the non-compressor ice cream makers. I also chose Sur la Table over Williams-Sonoma as WS could not ship until 23 July. I wanted an affordable ice cream maker with a built in compressor which means no need to pre-freeze the tub prior to making ice cream. No need to pre-freeze bowl. Reputation of brand. I chose this item because I love ice cream and I want to start making my own ice cream. My son wanted an ice cream maker and this was on sale. We love it. So easy to use. It was used in one of the cooking classes I attended and I loved how easy it was to use. saw demo during cooking class. Breville Brand is the best at everything electronic. I decided to purchase this ice cream maker after a cooking class at "Sur la Table". It has been a family favorite ever since. I can easily adjust the sugar and fat content of our ice cream, replacing it with fresh and flavorful fruits. I cannot remember last time we actually bought ice cream... Per fact appliance for the kitchen. It is simply the best! No mess and easy to operate. i love all breville products and purchased it now due to the great price, free shipping! i cannot eat diary and look forward to making delicious dairy-free ice cream! I recently attended a class and we made gelato using this machine. I was impressed with quality of the gelato. How does this Chef di Cucina Freeze and Scoop compare with the Breville Smart Scoop Ice Cream Maker? BEST ANSWER: I bought the Chef di Cucina after carefully comparing it to the Breville and I am very pleased. It came down to cost for me in the end. I love Breville products but figured other than cost there were no other real differences. It is easy to use, clean and makes great ice cream. I bought the Breville Smart Scoop. It's easy to clean. All the recipes I've tried that came with the machine has been good. The timer is automatically set for you when you choose the kind of ice cream and the hardness you want your frozen dessert. I love it! does this machine actually allow you to set the temp. and speed, thereby creating true gelato? BEST ANSWER: No. You can manually set the time, but not the temperature or speed. saying it makes a grinding noise and stops before the ice cream is finished. Has Breville addressed this problem? I was very disappointed to read that there are problems with this ice cream maker as I own Breville products and like them. BEST ANSWER: Have this machine and use it ALL the time - no problems. Only time it makes what might be called a "grinding noise" is when the ice cream is done and its thick, and that causes the stirring mechanism to strain. It simply means you're done so turn it off. Like any other recipe, your dessert may be done quicker than a recipe states - thats why we also cook with our eyes and ears. The higher the setting towards ice cream the colder the machine gets and the longer it churns so try setting it at a lower texture point. We actually have this ice cream compressor in our call center and used it a lot last summer. At first we did have our fair share of problems, but we discovered that most of our problems were user error. To get the most out of this ice cream compressor, you need to follow the instructions and suggestions precisely, especially the cool down process. do you have to freeze the mixing bowl prior to using? BEST ANSWER: No. This is an ice cream compressor so you don't have to freeze it first. In a question below, a potential customer comments, "Some of the customer reviews I have read are saying it makes a grinding noise and stops before the ice cream is finished." I have heard about this issue and am concerned as well. That's not what you want to hear in a review when you are spending this much money. One of 'the staff' replied that you have used this machine a lot and that "most of our problems were user error". Since a significant number of people seem to be having this problem, can you explain why the noise occurred, why the ice cream was not properly finished and what your solution to the problem was? BEST ANSWER: I remember answering that question. We used this ice cream maker off & on for a better part of Spring & Summer one year. The largest problem we had was with the bowling being wet. If it isn't dried thoroughly before you use it, it can start to freeze to the compressor, the paddle can freeze in the bowl, or the bowl & paddle won't lock into place. If the bowl or paddle freezes up, it will cause the machine to stop churning until it has been given time to defrost. where do i find recipes for the breville icecream maker ? BEST ANSWER: The instruction book has a number of recipes for making ice cream. After experimenting with those you can make modifications. I use less cream and more milk when I make ice cream. You can use any ice cream recipe for the Breville Smart Scoop Ice Cream Compressor but you can also go to their internet site and they list recipes there as well. Enjoy! I have been enjoying the recipes at are in the Breville instruction booklet and some that I've found on-line. How does it work for non dairy ice cream? BEST ANSWER: Made non dairy with coconut milk and some coconut cream! Banana walnut, mint chocolate chip, Tahitian vanilla, fresh raspberry & strawberry sorbet, mango sorbet (use A LOT less sugar than recipe requires). wow! they were all so good!! It works excellent. 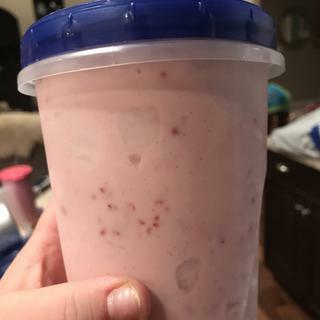 My girlfriend can't have dairy and we bought it so she could make more varieties of her own instead of always needing to find something at the store. It's buttery smooth! We love it. In the classes my wife has taken, she says the ice creams come out delicious!!! Breville is a great brand. Got this machine last year. Made lots of ice cream and kids and grandkids were elated. Went to use it for the first time this year and it churned for almost two hours and the ice cream never did get hard. At first there was hot air venting out the back, then turned to warm air. Does this mean my compressor has gone out? Or is there some other explanation? BEST ANSWER: I would call Breville customer service on this question. I appreciate all those who gave me help with this. I checked with Sur LA Table & found I was well within my 1 year warranty period so cal k ed Breville today, they sent me a label & as soon as they receive it, they will ship a new one. The young woman I talked to was super nice and super helpful. I am not a mechanic, but that is unusual behavior for this awesome ice cream maker. I would get the compressor checked out. Do not use it until then or you will burn out the motor. II would contact the manufacturer. How many paddles does this come with? BEST ANSWER: Just one, but I have not had any problems with it. FYI, I have only used this about six times, but it makes the most wonderful ice cream and gelato. Very happy with the product. Strawberry gelato made with fresh picked strawberries was particularly delicious--so much better than store bought. It is one unit with two blades to the sides. Only one. That's all that you need. Is it possible to control the overrun on this machine (that is, to reduce the quantity of air mixed into the base) to make true gelato? BEST ANSWER: No, it isn't. To control the overrun, the compressor & the paddle would have to run independently. Do you need to freeze the ice cream for it to harden? What would be the total time from start to having hard ice cream? BEST ANSWER: It takes a couple of hours in the freezer to get a hard texture but it's worth the wait. I love the cool down feature that allows you to put a warm mixture in the unit, then cool down, then churn. It's much faster than having to pre-chill for a few hours before churning. To have really hard ice cream, yes. Add about 15-20 minutes in the freezer, otherwise it is more soft-serve consistency. Freezing time in the ice cream freezer really depends on the temperature of your ingredients to begin with. Last night it took about an hour, but we didn't have the custard chilled all the way down. My experience has been for it to get to soft serve consistency or maybe a little firmer. This is on the maximum setting. You will need to place it in the freezer for more. Total time for me is about 45mins to an hour from still warm off of the stove to the consistency above. Personally, I prefer ice cream to be firmer than the finished consistency of the just made ice cream. In my freezer that can be around 3 or more hours, however it is only my preference. I do this to be able to get a firm scoop, but it is very acceptable right out of the machine. After your ice cream is done churning and you want it firmer, it's takes a minimum of two hours for it to firm up in the freezer. And be sure to take out of the freezer 10-15 minutes before serving! The ice cream comes out soft but servable. If you want really hard ice cream it would need to go into the freezer for half an hour or so. We always serve it from the machine. THe keep cool function keeps the icecream cold for up to 3 hours. The machine has a function where you can control the degree of softness that the finished product has. Yes you need to freeze the ice cream to make it hard. I do not know how long as I serve it soft and store remainder in freezer. 1-2 hours for hard ice cream. Can I make two consecutive batches or do I have to wait for a certain period of time before making the next batch? Can the motor handle numerous back-to-back batches? BEST ANSWER: I have had no problem in doing a batch after a batch. Just make sure that the tub canister is thoroughly dry before you make the next batch. If not the residue rinse water will freeze and the tub will be very difficult to remove. Bruce R.
Hi Tamara, You would have to wait to make before you can make the next batch. The only watch you can make a batch back to back is to have another bowl to when one batch is done. And the additional bowls are i believe $10 each from Breville. Yes, it can handle back-to-back batches! I have made up to 4, I'm not sure how many after that it could take but it is a great machine! I highly recommend it. You can make consecutive batches but you MUST clean and dry all the components before each batch. Yes! I purchased 2 of the ice cream “buckets” fir that reason and have done that many times. One summer I made four batches back to back for a BBQ. Worked great no issues. I've made 2 consecutively without any problem...it works great! After comparing the various ice cream makers with compressor, I have to decide between the Cuisinart ICE-100 Compressor Ice Cream and Gelato Maker and this Breville® Smart Scoop™ Ice Cream Compressor. Which one should I go for? BEST ANSWER: I like the Breville but I haven't used the others to compare. I made a lemon sorbet which was delicious! I've only used it once but it was simple to use. I would recommend it. It doesn't make that much though but the sorbet was enough as we each had a small bit with a cookie. I will be making a grapefruit sorbet to cleanse our palettes between courses. Right now my kitchen has been under construction and I haven't been able to use it but looking forward to experimenting with it. Have had the Breville for about a year and have made several different ice creams and sorbets. Found it easy to use with a good result. Best to remove the ice cream from the machine when done and put it in a container to freeze it a bit more before serving. Recipe booklet is clear and helpful. This was recommended to me by a friend and I would recommend it to anyone. Since we already have a Breville countertop oven/toaster, we knew the brand was excellent. So I purchased the Breville Ice Cream Compressor for our son and his family for Christmas last year. THEY LOVE IT! The ice cream it makes is fabulous. I'm thinking of buying one for our son and his family in Alaska! (not that they need icy desserts). I do not have experience with the Cuisinart but I have had the Breville for 2 years and could not be happier. Easy to use and makes the best ice cream and gelato. Other than cooking the custard base, which is not that difficult, there is very little work involved--the machine does it all for you. Good luck. I can only say I really like my Breville. I don'tknow anything about the other two. BEST ANSWER: I use my machine a couple of time per month in the winter and weekly in the summer. It still works well and I can make ice cream flavors that can't be found at the store. Yes, of course. Probably use it once a week in the summer. A little less in the winter. How does this work? My current ice cream maker has to be frozen in the freezer for awhile before I can use it. Is this faster? BEST ANSWER: This unit has the compressor built in, hence the expensive price. SO WORTH it!! Make sure not to overfill as mixture will expand and do not get any cream mixture under container. The machine is really a very small freezer and it works very well. Just pour in the ingredients and turn it on. We are very happy with our unit. Because this machine has a built in compressor, there's no need to freeze any bowls! Does this do well with making smaller batches of frozen desserts (like a half recipe)? BEST ANSWER: The recipe I use calls for 1 cup of whole milk and 1 cup of heavy cream. I've made that recipe and also doubled that recipe and the ice cream comes out great. If your recipe is smaller then 2 cups of liquid, I've never tried a recipe of that size with my Breville so I'm not sure. BEST ANSWER: This ice cream maker weighs about 35 lbs. BEST ANSWER: You can use both ice cream starter kits and your own ice cream ingredients with this machine.